Identifying dark purple small bottle lip sea glass? 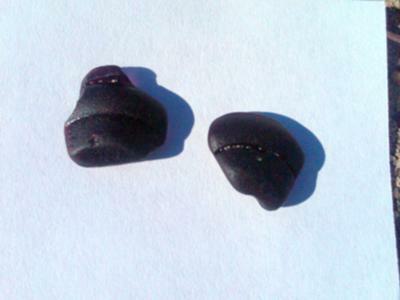 I found these two small pieces of dark purple sea glass during a trip to Cape Ann Mass this week. I was out there during the rain and wind storm. They were found yards apart. They appear to be a small bottle lip and are violet/dark purple in color. I am curious as to possible origin? Comments for Identifying dark purple small bottle lip sea glass? I am from Gloucester and have been collecting these imsulator pieces for a long time. I find at least 5 per day. They are my favorite. Yes, these are insulators from light bulbs and they also come in colors other than the deep purple. I have some in brown, olive and cobalt blue. I have many whole ones and they come in different shape and sizes. It's always a fun find. I recently found a dark purple insulator here in Hawaii. I see alot of people get them near lake Erie or on the East coast. What the heck is it doing all the way over here in the islands. It is a insulator, me and my wife find them all over. I think we must have at least 200 but never found one whole. I am in California and i just found a piece of glass with great interest. So I decided to look on the web for rare purple glass low and behold the first picture i saw were the two pictures above which are almost identical to the piece that is in my hand now. Not sure what it is from but they exist on the west coast too. im just wondering if they were ever just 1 piece :) wouldn't that be a trip? The tiny purple pieces are indeed insulator bottoms from old electrical fuses. I have several pieces that I found here in Newfoundland Canada. I also have almost a round piece somewhere in my collection. I have just started collecting. I found one on a beach in Guam yesterday. I have been collecting sea glass for approximately 20 years and have several pieces of the dark purple small lip sea glass. I have a sea glass book and it isn't mentioned in it so have been keeping them anyway as they are very pretty when you look through them in the light, otherwise they look black. I have so much sea glass that I started to make jewelery, wine glass charms, christmas tree ornaments, centerpieces, bracelet charms and anklets. I've been collecting sea glass in that area all my life. Anyway, I started finding those about three years ago and had no idea what they were. None of us did. And, I've only found them on one beach there. Are we all on the same beach here? I found the same thing along Cape Ann yesterday! The colour was so dense that they looked like rocks & didn't have transparency when held out to the sun but since they had a glass *feel* and one of them had a lip to it, I brought them home. They're black until you hold them up to a bright artificial light and the edge where they had been ground more was transparent enough to show a deep purple/burgundy colour. They have to be some of the best finds yet after a decade of the treasure hunt. Kelly is right Tony, these are insulators of some sort. I saw one for sale on ebay and I have some pieces and I have a whole one. All mine are black glass (black amethyst) great find!!! These are indeed insulators (from light bulbs and other electronic applications). I have a few in my own collection; I live on Cape Ann. I showed one to Richard LaMotte in Erie last October. It had a bubble deep inside, and he said that it had to be at least 100 years old. I have been told that these pieces are parts of insulators. I have found quite a few just like this and have also found some in cobalt blue that are the same shape. Just not sure what kind of insulators they are. I looked in my Sea Glass book and saw that purple and amethyst colored glass is very rare. Looks like you found a treasure. Not sure what kind of bottles, though.